Hall County was established in 1858 and covered an area from the South channel of the Platte River North, including Howard County and West, including parts of Buffalo and Dawson Counties. In 1871 the county boundaries were changed, leaving Hall county with the present 552 square miles. In 1858, the population stood at 116. It grew to 1,057 in 1870, 4,414 in 1875, 8,562 in 1880 and 48,925 in 1990. The first court case was in 1862. In Philip Feldman v. John Windolph, Feldman demanded $75 from Windolph for opening a letter belonging to Feldman and failing to forward it. In 1869, a complaint was filed against Charles Peterson for threatening to kill John Windolph and the proceedings were dropped. In 1868, Grand Island was voted the county seat. At this time Sheriff August Thorspecken, was in office. In 1871, a petition was presented by L.W. Rollins and 200 other inhabitants of Hall County to have an election for the purpose of building a courthouse. It passed with 150 votes. On July 3rd, 1872, a contract was sold to John W. Graham for $15,750, but a new contract was sold to Christian Anderson, D. Plunster and James Tout for $16,500 on July 12, 1872. When the courthouse was finished in June of 1873, Sheriff William M. Spiker was in office. 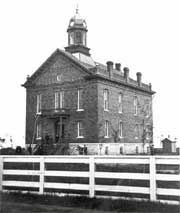 A special election was held in 1901 to construct a new courthouse and jail. It passed with 107 votes. The new courthouse and jail were built in 1904 at a cost of $131,142.51. Of that amount, only $11,418 was spent on the jail. They were designed by Omaha architect Thomas R. Kimball. Both buildings are still in use today. This series of photos shows the construction of the courthouse. The courthouse and jail were completed in 1904. The image to the right was taken shortly after their completion. The jail may not be completely finished at this point as the smokestack is shorter than it appears in other images. The Hall County Sheriff's offices were located in the courthouse until 1969 and at that time were moved into the jail that was built in 1904. William Ummel was in office at this time. The image to the left is the jail, notice that the smokestack is much taller in this image than in the previous one. In 1977 a contract of $2,000,000 was awarded for building a new jail and offices for the Sheriff and the Grand Island Police Department. In 1978 the project was completed and the Grand Island Police Department and the Hall County Sheriff's Department made the move. The new and old jails were connected and are still in use today. In the image below, you can see where the old jail is located by the smokestack. Unfortunately, today the existing facilities are too small and a new jail has been errected and is located along Highway 30 (E. 1st Street). The Hall County Sheriff's Department would like to thank the Stuhr Museum for providing the large portion of the information as well as the the majority of the photographs on this page. Joseph T. Rease served as sheriff from 1862 to 1865. From 1866 to 1868, Henry A. Rose served as sheriff. He was born in Geauga County, Ohio in 1835. He was a pioneer and settler of Hall County, farming 160 acres in 1863. Augustus Thorspecken was Hall County Sheriff from 1868 to 1869. Before being elected, he was appointed Captain at the O.K. Store set up to defend the settlement against Indian attack in 1864. In 1867 he was serving as a county commissioner and county coroner. Thorspecken was also a member of the committee to organize Grand Island as a town, and petitioned the county commissioners to form Grand Island as a second class city in 1872. He was then appointed as one of the original town trustees. In addition, he is listed as one of the early doctors of Hall County and was appointed County Physician in 1873. He then served as bailiff for the District Court beginning in October of 1873. From 1870 to 1871, Hugo Hald was sheriff. William Spiker was elected sheriff in 1871 and served until 1873, he was Grand Island City Marshal from 1873 to 1874. He came to Grand Island in 1866 and operated a livery. After his tenure as city marshal he rented the Nebraska House Hotel for a short time and changed the name to the State Central Hotel. In October of 1874 he was elected constable for the Grand Island precinct and was still engaged as constable in 1879. From 1876 until 1884 he was also an auctioneer in Grand Island. William A. Deuel was elected Sheriff in October of 1873 and was also Grand Island City Marshal from January 1874 until he resigned in May 1875. He apparently served in both capacities for a period of time. Deuel was a civil war veteran who had come to Grand Island in 1866. He started a lumberyard, William A. Deuel & Co., in 1871 but was out of business by February 1872. After his term as Sheriff he went to work for the Union Pacific Railroad and served as assistant superintendent, Wyoming Division. He resigned as superintendent with the U. P. in November 1888 and went to work for the Denver and Rio Grande Railroad in Colorado. He later returned to the Union Pacific Railroad and became superintendent of the Union Pacific Railroad. Joseph Kilian (1876-1881) and Henry C. Denman (1882-1883) were the next two sheriffs. James Cannon served as sheriff from 1884 to 1885. While Sheriff Cannon was in office, an investigation was made against him. The results were that the sheriff had received $646 for guarding the jail and said service had not truly been rendered. Cannon resigned and Sheriff Edgar A. Wedgewood was appointed. Sheriff Wedgewood was elected Hall County Sheriff November 1, 1885 and reelected in 1887. The Goodspeed "Condensed History of Hall County" (1890) stated, "socially, politically and as a painstaking and zealous official, we find none whose record in point of excellence, excels that of Mr. Wedgewood. His retirement from office in the spring of 1889 was witnessed with many regrets." Wedgewood was born May 2, 1856 in Lowell, Massachusetts where he also attended and graduated from high school. He then came west with his parents. He engaged in the building business before being elected sheriff. Wedgewood also served on the Grand Island City Council. Sheriff James A. Costello was in office from 1890 to 1893. Costello was born October 15, 1860 in Pittston, PA. He had been engaged in farming and railroading until he accepted the position of Deputy Sheriff under Sheriff Wedgewood, a position he held from 1887 to 1889 when he was elected sheriff. Hugh McVay was appointed deputy under Costello and was given a salary of $700. George P. Dean served as sheriff from 1894 to 1897. He was born in Steubenville, NY on November 22, 1846. His family moved to Michigan prior to the Civil War and settled in Hiawassee County. From there, he enlisted in the Tenth Michigan Calvary in 1863 and participated in a number of skirmishes during the war. He remained in the service for three years after the cessation of hostilities, serving at posts throughout the South, and was discharged as a sergeant of Company H, 18th United States Infantry. In 1869, he returned home then moved to Nebraska in 1872. He engaged in farming until 1884 when he started a Livery Stable in Grand Island. He served in numerous capacities including Chief of Police of Grand Island, City Board of Supervisors, Justice of the Peace, and Commander of the Grand Island Legion No. 9. Samuel N. Taylor was Hall County Sheriff from 1898 to 1905. He was reelected twice. Sam, as he was known, came to Wood River, Nebraska in 1886 after serving five years with the U.S. Cavalry and opened a harness business. In 1892 he was elected city marshal for Wood River. In 1897 he won the Republican nomination for Hall County Sheriff and was elected. He resigned in 1905 to open a sheet metal company. J.W. Eby served as sheriff from 1905 to 1906. One of the most colorful sheriffs in the history of Hall County was Sheriff James M. "Jimmie" Dunkel. At age 32, Dunkel made his first bid for public office when he ran against the incumbent Sheriff Taylor in 1903. He lost that election by only 55 votes. One of the major reasons for his loss has been attributed to an accident at Grand Island's July 4th celebration in 1903. Apparently Dunkel inadvertently allowed sparks from a pinwheel to fall on a stack of Roman candles and skyrockets which ignited and then stuck several citizens including Sheriff Taylor. (It is interesting to note that Dunkel served as president of the volunteer fire department for several years.) Dunkel ran again for sheriff against Eby in 1905 and won that election by nearly 600 votes. Dunkel was an auctioneer and continued to cry auctions during his term of office. Dunkel had a good sense of humor. A photograph taken in the sheriff's office, located in the courthouse, shows Dunkel at his desk with a drawn revolver in his right hand and cigar in his left. He is surrounded by five men and a woman, all displaying firearms. The lady is clutching a hand gun in each hand and one of the men has a fixed bayonet. Sheriff Dunkel may have also been one of the forerunners of the modern K-9 units. As early as 1908, Dunkel had been training his dogs to help in law enforcement. He apparently abandon the idea after one of the dogs was poisoned, as stated in a Grand Island Independent news brief, "Sheriff Dunkel ... believes, anyway, that one can do quicker work in capturing thieves with the telephone than with dogs." Dunkel was killed January 10, 1912. He had cried an auction in Chapman, NE, and was awaiting a train to come back to Grand Island. He crossed the tracks and was struck be the train. Dunkel's funeral was probably the largest in the county up to that time and his was the only body to lay in state at the courthouse. Services were held in the district court chambers. Dunkel had been president of the Nebraska State Sheriff's Association and a vice-president of the National Association. Many regarded him as a "shoe in" for the national president had he lived. During Dunkel's term, his first two deputies were George Sass in 1910 and William Cords. At the time of his death the deputies were Gus Sievers and Cords. Sievers was appointed as Dunkel's successor. Gastau Sievers was appointed in 1912 and served as sheriff until 1918. He was born July 29, 1858 in Hoilstein, Germany. He learned the carpenter trade as a young man. He and his family came to the United States in 1869, homesteading in Howard County in 1871. The family later moved to Grand Island. John E. McCutcheon was Hall County Sheriff from 1919 to 1922. He was born in Vanderburg County, Indiana on May 3, 1867. He and his parents came to Nebraska in 1874 and took up a homestead in Hall County in 1875. C.J. Doron served from 1923 to 1924. Charles J. Palmer was Hall County Sheriff from 1925 to 1930. He was born in Grand Island on July 10, 1882. William Ummel (1963-1970) rounded out the period. Sheriff Charles F. Headley was probably the most progressive sheriff since the 1800s. When Headley took office in 1970 there were four deputies. He increased that staff by 1978 to include 12 deputies and 3 secretaries. He started a Criminal Investigation Division, a Warrant Division, and a Road Patrol Division. Sheriff Charles F. Fairbanks was elected in 1979 and resigned in 1987. During his tenure as sheriff he handled both the 1980 tornadoes, which destroyed approximately one third of Grand Island and the 1983 Arthur Kirk standoff which occurred in Rural Cairo. In 1987 Emmett Arnett was appointed Sheriff and was later elected in 1990. Sheriff Arnett was involved with the creation of the Federal Drug Task Force. A task force involving numerous central Nebraska law enforcement agencies uniting to fight the war on drugs in our communities. He assigned a full time position to the unit. In 1993, the Hall County Jail, which had been under the management of the Hall County Sheriff since 1858, became the responsibility of the Hall County Board of Supervisors acting as the Hall County Board of Corrections. A Corrections director was appointed to run the jail. Sheriff Arnett left office in 1994 and currently works for the county in another capacity. In 1994 James Fosket was elected Sheriff. Sheriff Fosket brought many new and innovative ideas to the department. He introduced the K-9 unit and focused on technology and equipment upgrades. During his short term in office, many strides were made. He resigned his position in 1997. Terrill Perkins was appointed Sheriff in 1997 and remained in office until 1998. In 1998, Jerry Watson was elected Sheriff and remained in office through 2018, and Sheriff Rick Conrad was elected Sheriff in 2018. The Hall County Sheriff's Department would like to thank the Stuhr Museum for providing the large portion of the information as well as the photographs of Sheriff Dunkel.